I'll keep the intro short and sweet... My friend Tanya invited me to this Airfrance party where they were raffling off flights and 2 night stays in Paris to 3 lucky couples. And you had to come to the event with your hand luggage and passport in hand cause you know you might be lucky enough to fly to Paris that night. So what do we do, we show up luggage and passport in hand and wholeheartedly believe that we, out of maybe 100+ people would get picked. Well we didn't. BUT we drew so much attention to us that evening that when one of the couples who did get picked had to cancel they chose us as the runner up! Dreams do come true! Flights, accommodation and transport all taken care of thanks to Airfrance! Merci Beaucoup! 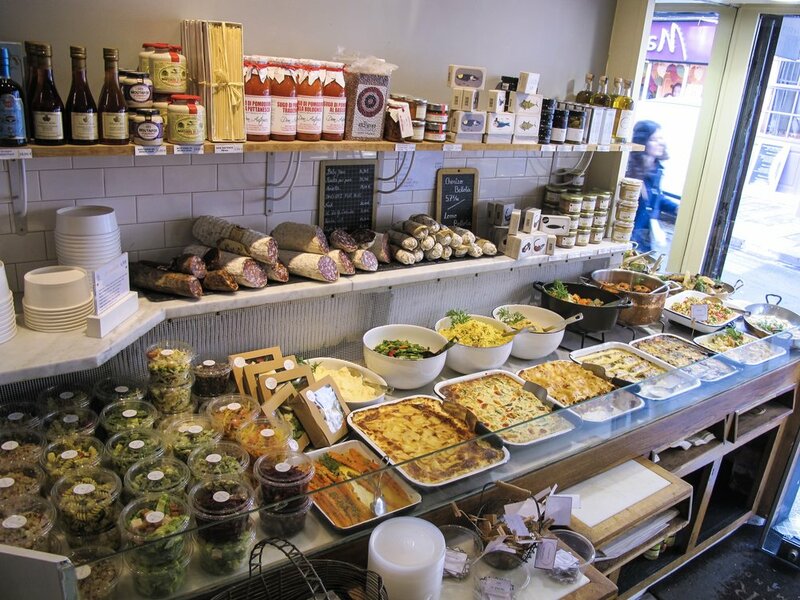 Francart, Ile de la Cité (little food shop) - after walking from our hotel through the Jardin des Tuileries and along the Seine we side stepped into this little food shop for a bite. There was barely any space but the shop was stuffed to the rim with delicious food. It looked like super french mom laid out all her meals, baguettes, cakes and desserts for the week in this shop. It tasted like it too. I grabbed some sandwiches and a piece of cake and devoured them once we plonked our butts down in the Jardin du Luxembourg. Au Petit Suisse, Jardin du Luxembourg - We found this spot just outside Jardin du Luxembourg and it was the perfect spot to soak in the sun a little more with a hot chocolate, it wasn't too busy over here and was really a nice spot to chill out before getting back on our feet. They didn't have too much of a pastry selection but not that we needed anymore gluten did we..
L'Atelier, Montparnasse - You'll find this spot on one of the main streets of Montparnasse so it's a bit of a more tourist-y spot to eat and a bit pricier too (because Paris). It was a decent place, nothing too crazy to write home about, I'd suggest to try to dig a bit deeper when in Montparnasse. Royal Turenne, le Marais - Around the corner from Place des Vosges (walk through here, it is super cute) is yet another bistro we loved. Tanya and I shared a cheese platter here along with some wine and it was the perfect way to finish off a long day of walking. Regardless where you go, have some wine and cheese. La Mascotte, Montmartre (seafood) - If you find yourself in Montmartre and want to find a spot away from all the tourists and better yet, have a thing for oysters, this is your spot. Tanya was all in for the oysters but I stuck with the fish soup. Au Vieux Paris D'arcole, Ile de la Cité - Hidden in an alley around the corner from the Notre Dame is this little gem. The facade outside is covered in beautiful flowers and the waiter puts out this perfect air of Parisian arrogance to make this a truly authentic Parisian spot. Francois Felix, Place de la Concorde - On our last night it was raining and we didn't have the energy to go far. Lucky for us this little gem was just around the corner with the most entertaining waiter waiting for us. We shared a steak frites and salad and that was plenty for us. Jardin Du Luxembourg - Make sure you have a bottle of wine, coffee and/or a baguette with you when you step into this garden. You'll want to sit down, soak up the sun and enjoy the view. Maybe it was the time of day but it wasn't overrun by tourists, just the ever-running Parisians (they are serious joggers). Montmartre - Another cute area to pass through, it does get crowded around the attraction areas but there are plenty of side streets to escape into. We found one little alley with some funky street art (man hanging out of the wall included. Oh and you can get yourself sketched by one of the artists walking around, but be prepared to stare at a building for a good 30min. with people trying to navigate around you. Le Marais - This area is a bit alternative but more than that it is the gay district and unfortunately a bit heavily overrun by tourists. It is cute however and there's always little alleys to be discovered. The Eiffel Tower - Well more like ran through on our last morning before we had to catch our flight. We didn't go up unfortunately, we came we saw, took our photos and bounced. After all we just had 60 hours to see Paris. Let me know if you've been to these places and what you think below!